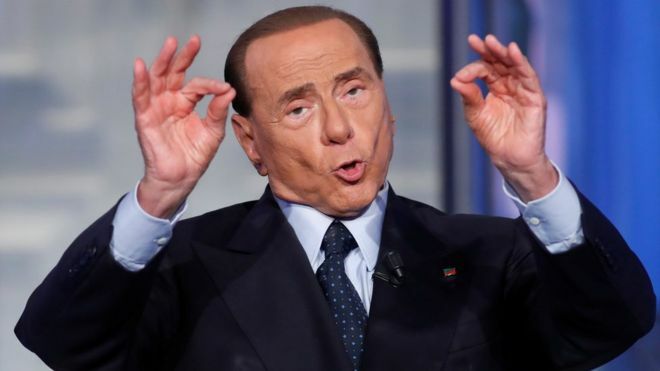 Italy's centre-right ex-prime minister Silvio Berlusconi is celebrating local election success in an alliance with two right-wing parties. Mr Berlusconi's Forza Italia won 16 of 22 cities with the anti-immigration Northern League and another party. The results were a setback for Matteo Renzi, the former centre-left prime minister seeking to return to power as head of the Democratic Party (PD). "It could have gone better," he admitted in a social media post. The PD currently heads a coalition led by Paolo Gentiloni, who took over after Mr Renzi lost a referendum on electoral reform in December 2016. The biggest defeats for the PD were in party strongholds such as Genoa, La Spezia and L'Aquila. The centre-right also won in other provincial capitals including Monza, Piacenza and Pistoia. Mr Berlusconi, 80, will now set his sights on the next general election, which is due in 2018 but may take place earlier.